Oh dear, has it really been more than a month? Meet the new member of the clan. My employer from this summer happened to find him abandoned in the middle of the road. Thankfully, no one hit the poor little guy and she rescued him and got him some food. I don't think her husband was too keen about adding a puppy to the mix at their house, so I made a quick call to mom, and I'm going home this weekend with this little bundle. 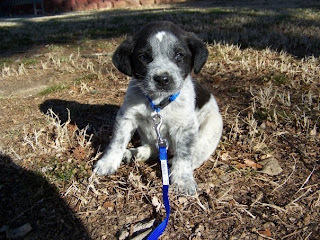 He's really tiny, possible Blue Tick mix, and snuggly. Other than that excitement today, I've moved to a different dorm, started classes, attempted to join a sorority (and failed), done some crafty things that may eventually get posted about, and had a great break/first couple weeks of school. I look forward to getting back into a routine. Anyways, I better stop procrastinating and actually get some homework done instead of awwing over my puppy's sweet picture. I mean, look at this face. What's not to love? I stalk your blogs. Also, glad you could get a new room, and the puppy is adorable.